In this chapter, I show how the hidden injuries of class continue into adulthood. 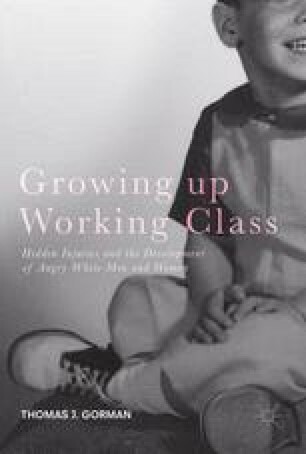 In my previous research on social class (reprinted in this chapter), I found that a large segment of the white working-class are angry; they lash out at middle- and upper-middle-class, college-educated, white-collar workers. Their frustration with their current economic situation pushed them to lash out at the “other.” The lack of self-confidence, again, reared its head as an important issue for understanding their feelings, even as adults. The working-class parents used words such as “maybe” and “hopefully” when discussing their children’s chances of going to college. Interestingly, working-class women were found to be somewhat less angry and bitter. Some possible explanations for this finding are offered. Meanwhile, middle-class parents “assumed” their children will attend college and go on to successful “careers.” This chapter will also introduce the idea behind “hard” vs. “settled” living working-class families. Educational credentials are one of the main badges of ability (Sennet and Cobb. The Hidden Injuries of Class. New York: Vintage Books, 1972) that are awarded in a capitalist system. In comparing my educational career and my family’s cultural capital with the findings from my previous research, we will see that the story is not one dimensional (structure). The active participation of important figures (agency) can help some working-class kids—to not—get working-class jobs (Willis. Learning to Labor: How Working-Class Kids Get Working-Class Jobs. Aldershot: Gower, 1981). Even though I attended a vocationally oriented high school and community college, active agents in my life interceded and helped mitigate the hidden injuries of class. Still, my lack of self-confidence rose and fell like a roller coaster throughout my acquisition of BA, MA and PhD degrees (and even into my professional career).